Sometime in the middle of 2014 I was asked by my friend and mentor James Schramko to film a testimonial for his fantastic annual event Superfast Business Live. When I saw the resulting clip, I was so horrified with how I looked that I resolved then and there that I had to lose the 20 kilos I had inexorably gained in the past 4 years. What did I actually do? Well, nothing. Kept eating and drinking. How I tried. I invested in and committed to all of the following; 3 x juice fasts, the lemon detox, the 5:2 diet, the CSIRO diet, a raw food diet, I Quit Sugar, giving up all carbs, meal replacement shakes, a “virtual” gastric band (via hypnotherapy), a very expensive (and soul destroying) diet coach, a drawer full of supplements, powders and included imported “miracle” skinny pills, a diet for people who care too much, weight loss meditations, energy healing and at least 4 more diet variations that I may have blocked out. I had the desire. I was ready to start. I invested sometimes well into four figures on these “solutions”. Some of these diets were successful for friends. Nothing worked for me. On occasions I stopped gaining weight but at no time did I lose any. In early October I sat opposite a friend of a friend at a 50th birthday party. It was a degustation menu in a superb Sydney restaurant. As the night progressed I noticed her courses had been modified and asked about it. She told me she was on a diet, and had lost a large amount of weight in a short time. I (of course) enquired further and her first words were “it is super strict, but it really works” (priming and positioning – and still the same words I use when I have “the diet” conversation). It turns out I did know of this diet, all my previous research had led to it, but there was always a stumbling block that meant I couldn’t proceed. My new friend Lisa had put the last piece in place, she had found someone who had made the diet (which was designed in the 1950’s) simple and accessible. I followed up and she sent me a link. Without a huge amount of thought about the timing, I paid for and received my starter kit. I read about the diet (pretty daunting, especially black coffee and no alcohol), but I thought “what the hell”, I’ll give it a try. I went food shopping, cleaned out my fridge and cupboards and purchased a few bits and pieces. On the first 2 days of the diet you load up with good fats so the strict program doesn’t start till the 3rd day. On the 4th day I lost 500grams. On the 5th day I lost 400grams. On the 6th day I lost 300 grams. 1.2 kilos in 3 days …. And so it went on, I lost 2.5 kilos a week for 6 weeks in my first round – 14 kgs in total. My father was seriously ill, in palliative care. My business growing so fast it was ballistic, plus I had to move offices. I had to terminate the contract of the person managing my business (complicated by the fact she was a friend facing difficulties in her own life) and hire and train a new manager during the craziest time of year. Most people thought it was not a “good time” to be dieting. I tend to challenge that, as strange as people thought it was, I was going through such a difficult time with grief that dieting seemed the least of my issues. I could control what I could put in my mouth, much more than I could control many of the other circumstances. So why did this diet work when so many had failed? I’m going to propose this formula, in my favourite framework, the venn diagram. The main circles are the essential prerequisites required. But where the magic happens (just like life) is in the overlaps. The first pre-requisite is the BURNING DESIRE. Tick, I had this. This was never my problem. The whole time I was gaining weight it was completely at odds with my view of myself. Everytime I saw a picture of myself I was taken aback. The reality didn’t match the picture I had in my head. I barely shopped and loathed any occasion that would require me to dress up. With each weight gain I kept “normalizing it”. My shirts and pants sizes crept up and up and I could only shop in those corners of the stores hidden down the back. From 2012 to late 2014, I can’t remember a single person saying I looked nice in any outfit, which spiraled into less and less effort (and pretending it was liberating to not care and refuse to be judged). I was also ready to start. I had started, over and over and over (and over). I had the money to pay for what was needed and I could start in “real time”. The third pre requisite is the external one, where you bring in support to reach your goals. I had tried and failed at many previous eating plans (and some frankly didn’t involve eating food, but slurping liquids so I use the term “eating” loosely). What I hadn’t found in previous attempts was the right system with the right tools, resources and support. When investing in solutions you can (and should) research the credibility of the claims and apply it to your own criteria. You can also be reassured by recommendations and the experiences of others, but at some stage you have to commit, jump in and give things a try. You will go up some blind alleys and waste money, energy and time, that is learning. The important thing is to review what did and did not work AND stay open to the possibility that each step was a lesson well learned and there will be a tool that will work. These are pre requisites for a reason. If you review some of your own successes I’m sure they were all present. I’ve had times in my life before where I’ve had the burning desire but wasn’t ready to start (oh, and how painful that is to carry a desire but be unable, through real or imagined circumstances, to take the action that will bring it to fruition). We’ve already discussed those so called “failures” where I had the burning desire and was ready to start, but the tool was a blunt object. 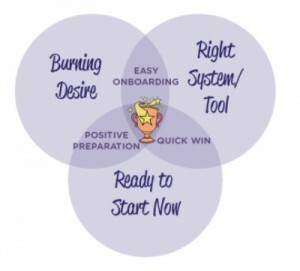 So let’s assume you (or your potential clients) tick all the 3 pre-requisites for success. Where do your opportunities lie to improve the likelihood of a stunning result? These are areas that you can – as a know how entrepreneur, trainer and program developer – leverage to yield fantastic results in your programs. Bring people into your solution or platform with ease and grace. Provide uncomplicated starting instructions. Is it just me or do you hate enrolling in a program and getting a long list of technical steps? ; now go to this page and you’ll need to log out and in again and then set up your password, make sure it is 8 letters and then, and then, and then … make it as easy as it can be, clear actions, get me to the good stuff quickly. Provide well formatted information. Don’t overwhelm me with years worth of posts and training. Just what I need to start. And if I want more, there it is, let me search and find it. Anticipate what questions they will ask and when (and have answers available). Giving them responsive support – that they may need once, or not at all. (I think every program I ever joined I needed a tiny bit of support time at the start but then I was off and running). The opportunity here is to engender commitment and meet readiness with appropriate, interesting, active preparation. Not just sending a bunch of random information or links to dozens of article or threads. Don’t ask them to spend a lot of time or money, though some “gathering” or “decluttering” readiness tasks could work, especially when justified. Use the positive preparations to remind them of the benefits of the changes you are asking them to make. 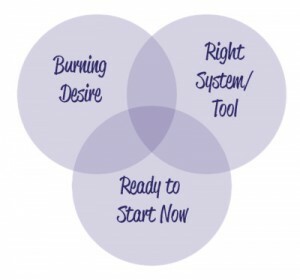 Create exercises to reflect on their burning desire and readiness to start. Perhaps think about likely obstacles or pitfalls and how they could future proof themselves. Suggest how they could set up a baseline and measurement system (people often forget where they were, so measurement is incredibly validating). Allow them to go a little deeper and visualize themselves “owning” the results that are coming their way. Insightful, well thought out preparation will re-inforce that your program will be a good fit with their life. Remind them of the benefits of the changes you are asking them to make. The possibility – the probability (!) that they will reach their desire. All that said, it is the third of the opportunities I believe is the single biggest reason I succeeded with this diet. Give them something that represents immediate progress. In the case of my successful weight loss program, I stepped on the scale and had lost a significant amount of weight after my first day on the strict food regime (we just mentioned measurement, that factored in here as well). Where could be a quick win in your program? Something that shows they have finally got the right tool and a solution to their problem is close. My friend Rebecca Bradley in her PinRight program increased my Pinterest followers 12 fold in 24 hours! It showed me what was possible and that with this platform I could get results very fast. Perhaps it is an epiphany that changes things for clients? Perhaps step one is freeing up time for more work by stopping a bunch of draining tasks? I ask my private clients to do positive preparation – which I review so I can prepare appropriate exercises and frameworks. Then together we can define their ideal client or nail their value proposition within the first 30 minutes of our session – our quick win that sets up the day for success. Of course this is just the start of a successful program, but a positive start will lead to a major improvement in outcomes. You’ll have clients do your marketing for you as their success will be noticeable to those around them! Challenge: How Can Your Training Incorporate These Insights?